The only sure thing; it’s likely to continue as Google stays its course in refining standards for quality content. And in a post-Panda and Penguin world, smarter more meaningful link building is not only recommended but a requirement. 7 Link Building Philosophies to create value and remain Penguin-friendly. Shared with the audience by Jon Ball of PageOnePower. Imagine if Google didn’t exist, where would you spend link building efforts? What would you do and not do? Keeping asking yourself this: If Matt Cuts were looking over your shoulder would you continue pursuing that link? To avoid the penguin or next iteration of algorithm updates, start matching your link building with an audience-centric marketing plan. Who can we help and with what information? What makes sense? This should be common sense, but continue repeating this to yourself and your team. Does it make sense to get a link to your cat food site from a brain surgery forum? 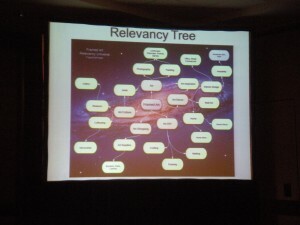 To do this, create a relevancy tree to better understand how your core topics are related to others. Start with those that have online communities and start building out based on relevance. This is where link building opportunities start rising to the surface. People link to people. And the best links come from people, not forms or any variety of insta-links. The best link building asset you have is your brain. The ability to make connections between your content, its value and your audience is all housed between your ears. Link building alone is like building a fire with one log. The spark you need to concept creative content and link building strategies is best done in group settings. Brainstorm Sessions. Activities. Creative Idea Contests. Whatever it takes to get your team generating ideas. Trying to get something to go viral, is like trying to catch a cold. It’s not up to you. It’s up to the others around you and how motivated they are to help spread your content. Create content that’s always in pursuit of ‘For the better of mankind’. We have to make peace with the idea that no one cares about our products / services (at first). Asking people for a link because your awesome isn’t of value to anyone but you. Provide value. Help people. Offer solutions to problems. Next is taking philosophy and putting it into action by making a plan. Warning: don’t underestimate the enormity of the task before you. To do it right, it takes time and effort. Identify the assets you currently have available both on and offsite. Download and review your backlink portfolio and that of your competitors. Prioritize research based on who is currently ranking Page 1. It’s time to brainstorm, no idea too big or small. Let it all out and see what your team can come up with. Once you have a list to work from, start prioritizing based on relevance, impact and feasibility. Link building efforts should match up with the overall editorial plan driving your marketing content. Work your link building ideas into a schedule to keep everyone on track. Try not to execute all ideas at once. You will learn as you go and you want to be able to leverage what you have learned as you move forward. You will fail. It’s the way it is. Know that and be ready to adapt. You will also succeed. Celebrate and keep doing the things that work. Honestly, I didn’t attend to such Google update, both Panda or Pinguin. But this is the approach I’ve done since 6 months ago for link building : write a content that may be useful then I tell many folks out there that potentially interesting (targeted audience). So far, it seems working well for me. Traffic to my site starting to grow. a network among them has more benefits than just improving your SEO. With all these algorithm updates now taking place, it’s getting more challenging to do SEO. Black Hat SEO’ers have given many people a bad name in the business. What you think of learning from certain gurus today such as John Chow? I have been reading that directory submission could be a thing of the past? Then I see in another blog that its fine if the directory is not banned or penalized with google. Also that anchor text must match on all directories submitted too? I am looking a a cheap online submission service linkdirectorysubmissions.com, has anyone had any experience with them? and would this be a good idea? information on link building .Thanks for sharing. Here I got. The first such blog that has stressed on the working phenomena that should be expected this year post-panda-penguin updates. Nice effort on such a heated topic of link building. It will definitely ease a lot of people off their anxieties. I really like the FTBOM. It is definitely best to think of ways to be beneficial to all rather than a quick possibly dangerous way to rank better.